Powerful 10mm dynamic driver with the speaker resistance of 16 Ohm. Comes with 1.2 meters perfect length cable now plug it in anywhere with ease. boAt BassHeads 100 Stereo In-ear Earphones are designed to give you an Experience which no other brand can match. It has an incredible sonic clarity sound with Super Extra Bass. 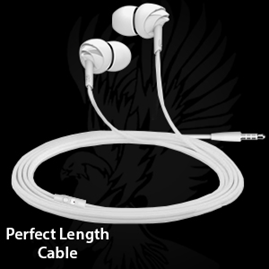 With tangle free braided cables, you are expected to be hassle free. As the headphones feature 10mm drivers, they give you clear sound with that Thumping Bass. In Built Noise Isolation Mic ensures you don't miss those important calls. With two exciting Colors that match your style in your day, the boAt earphones are the ideal choice for anyone who can carry that attitude. 1. Personalized earphones, just like the hawk!This cool earphone follows the latest fashion trend, giving you the unique exquisite appearance, plugs you into the world of awesomeness. 2.With the best imported materials & high elastic diaphragm, you could enjoy high resolution bass stereo sound with 10MM Drivers. 3. Compared to the other brands, BassHeads 100delivers a wide range of frequency with crisp highs and powerful lows, you can get the same fulfillment from music. 4. Sports a 3.5mm jack, compatible for iPhone, Samsung, Nokia, HTC, Xiaomi, Huawei,Tablets, PC & other 3.5mm supported devices. iPhone, Samsung, Nokia, HTC, Xiaomi, Huawei,Tablets, PC & other 3.5mm supported devices. Get Ready to Unleash the Hawk in you! boAt BassHeads 100 Stereo In-ear Earphones are designed to give you an Experience which no other product can match. As the headphones feature 10mm drivers, they give you clear sound with that Enhanced Bass. Making life easier on the go, the in-line microphone does it all for you without arising the need to unplug your earphone from your everyday entertainment device. In Built Noise Isolation Mic ensures you don t miss those important calls. With the all new frosty white and jet blackcolours that match your style in your day, Different from the usual boring candy looking earphones, boAt earphones are the ideal choice for anyone who can carry the Hawk Attitude . Just Plug Them in and Plug into Nirvana! The perfect way to add some style and stand out from the crowd with the boAt BassHeads 100 Hawk inspired earphones. Created to make your lifestyle better in every possible way, the stylish BassHeads 100 superior coated wired earphones are a definite fashion statement. Now wear your attitude with amazing Jet Black and Frosty white colours and get ready to turn heads wherever you go. Different from the usual boring candy looking earphones, boAt just Hawked the boring looking earphones. The boAt BassHeads 100 Wired Earphones features a HD microphone to make crystal clear calls. 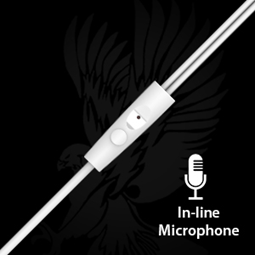 Making life easier on the go, the in-line microphone does it all for you without arising the need to unplug your earphone from your everyday entertainment device. The microphone has a separate button to allow you easy functioning. Easily take calls and manage your music on any smart device. Play/pause music or answer/end calls with one-click, track forward with two-clicks, or back with 3 clicks make these earphones extremely user-friendly. boAt understands how life can be tough, that s why we created a tougher earphone for you. 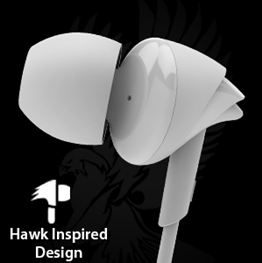 Bassheads 100 inspired from the Hawk design comes with a Hawk Attitude and gives you freedom just like a hawk. With 1.2 meters perfect length cable now plug it in anywhere with ease. While the earphones are extremely user-friendly & stylish, extruding premium coating on the wire cable is a manufacturing process that we've been performing and refining since our company's inception. Fits you better than your t-shirt! 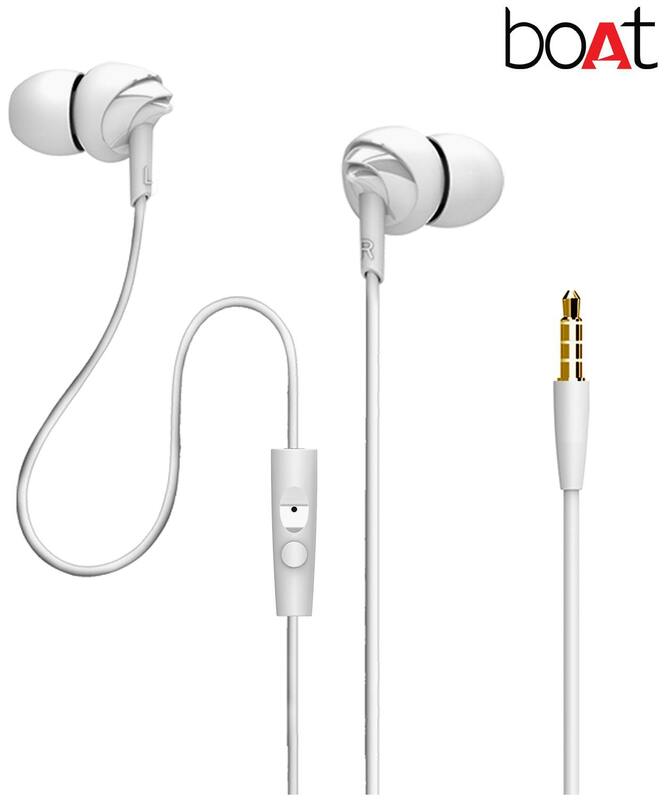 The perfect 100 score one can achieve from an earphone, its impeccable fit won t let you take these wonderfully amazing earphones off. Fits you perfectly without hurting your ears. 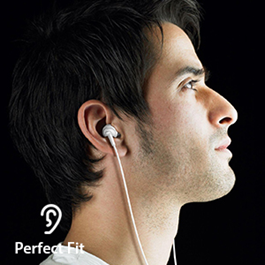 The Perfect arc, with different size ear tips helps you in achieving superior comfort even with long listening hours. Good music is important in life but perfect fit is Mandatory .